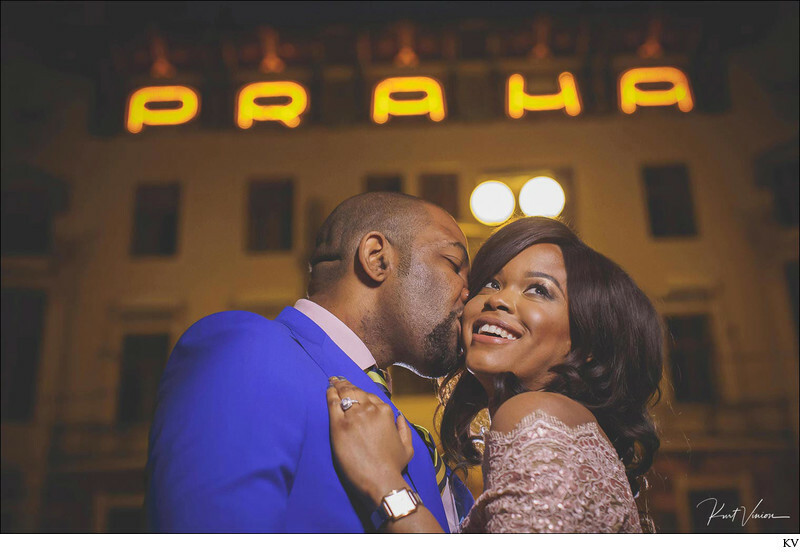 Introducing one of our many gorgeous couples from this year: Amala & Emeka who hail from Nigeria but are currently living in London. 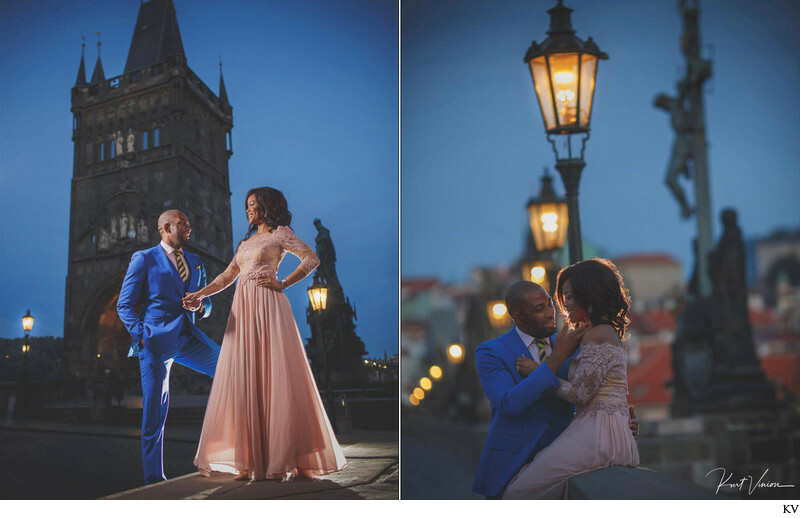 They wanted a session that incorporated the best locations in Prague but without the hoards of tourists who over take this city daily and so a sunrise session was especially tailored for them. 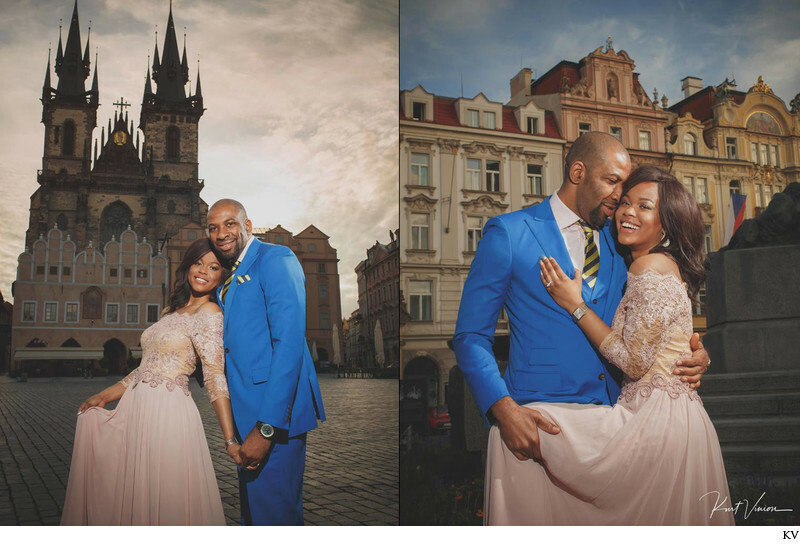 What they also wanted was a very clean, studio style of lighting which meant that many of their images were art directed - exactly what they were wishing. 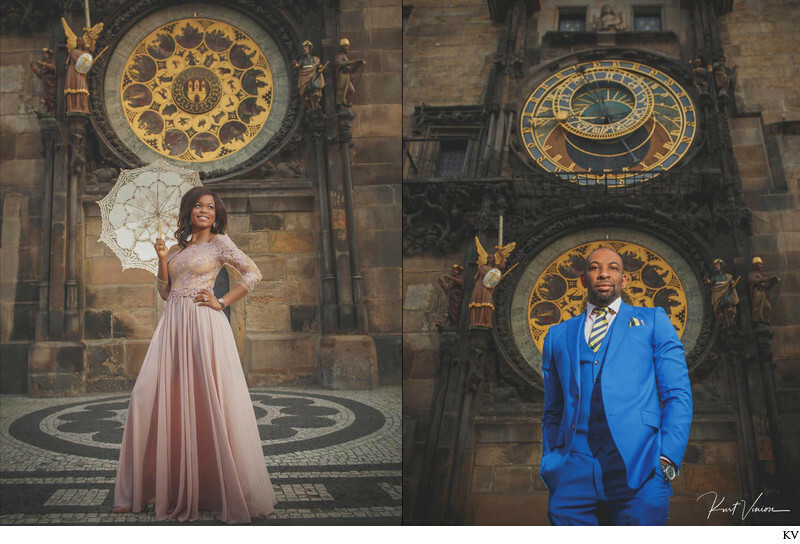 Since they flew in from London the day before they had not had a chance to take in the sights yet and so we decided to start our session in front of one of the most beautiful buildings in Prague: the Praha Assurance building. This Art Nouveau masterpiece is one I highly recommend and visiting this building at dawn where the neon ‘Praha’ is lit is really a wonderful way to start off the day. 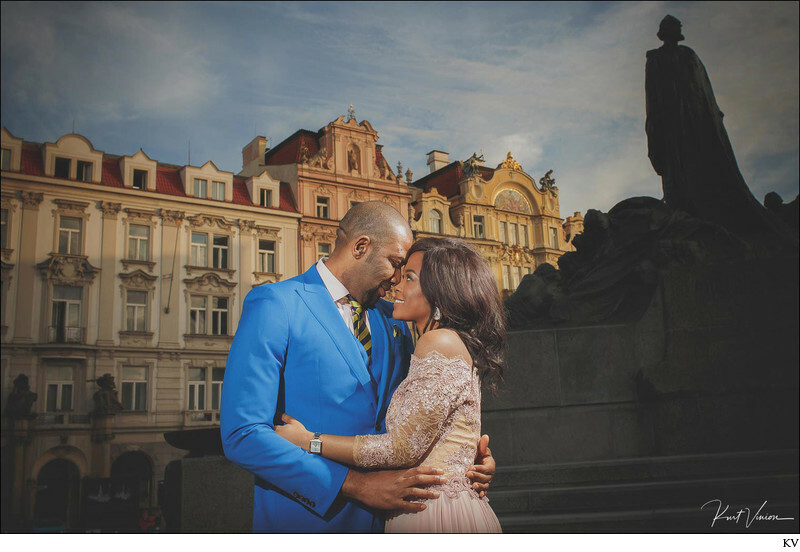 Led by our favorite hair & makeup artist Eliska who brought them down to where the crew was waiting, you can tell that this was a great starting point as Emeka & Amala were simply blown away by the atmosphere and the buildings beautiful & ornate facade. Later we headed to the historic Charles Bridge and luckily there were not that many tourists. Seeing the sky change colors and the early morning light hit Prague Castle is truly a site to behold. 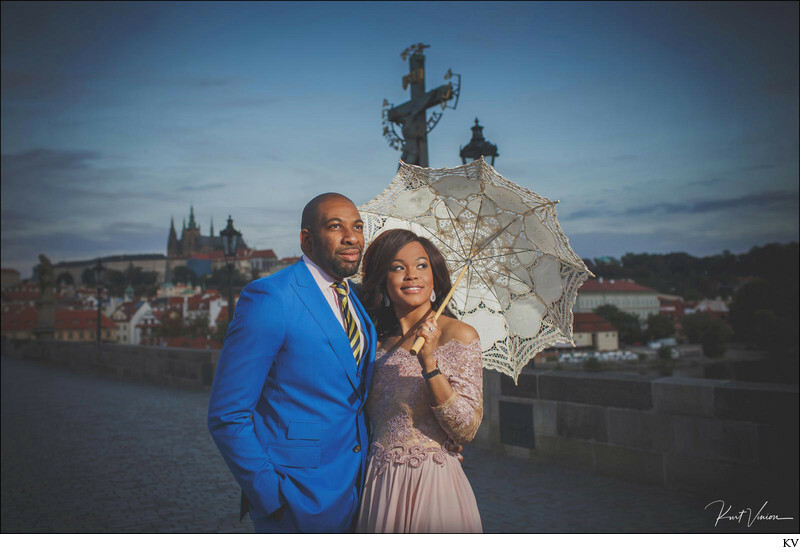 The smile on Emeka’s face watching Amala take in the incredible atmosphere was worth the entire trip and she absolutely glowed standing there with a parasol in hand. Our next location was the Old Town Square where luckily there were only a few stragglers left over from the previous nights partying. Without a doubt Old Town Square should truly be enjoyed at sunrise. Watching the sun break above the skyline of spires and especially when you walk hand in hand under Tyn Church with your partner in a nearly empty historic location as this is in a word – unforgettable. 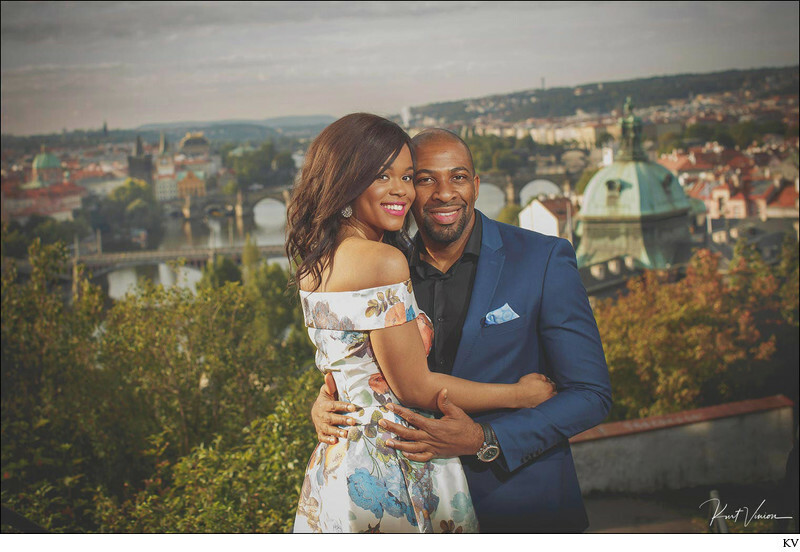 But like all wonderful session they must come to an end and Emeka and Amala chose my personal favorite place – the Letna overlook for their final location. This truly is a stunning location as the city awakes and the sounds of trams, boats and many cars (too many actually) and pedestrians start their new day in one of the most beautiful cities in Europe. 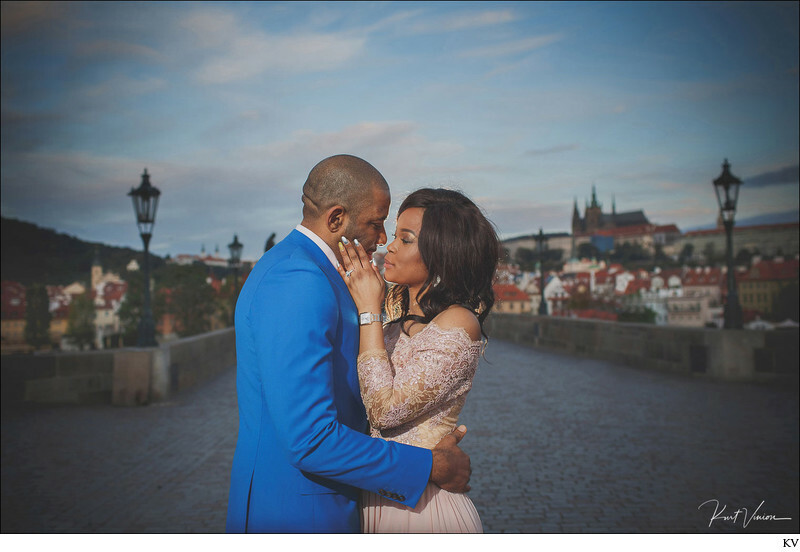 After a few moments of soaking up the sunshine it was time to say our adieu’s and let Emeka & Amala explore this wonderful city on their own terms – hand in hand. Kurt, first of all, let me thank you for the amazing pictures. Amala (thanks for the compliment by the way) and I are extremely excited… Once again thanks for giving us a wonderful gallery of pictures which we will enjoy for the rest of our lives. 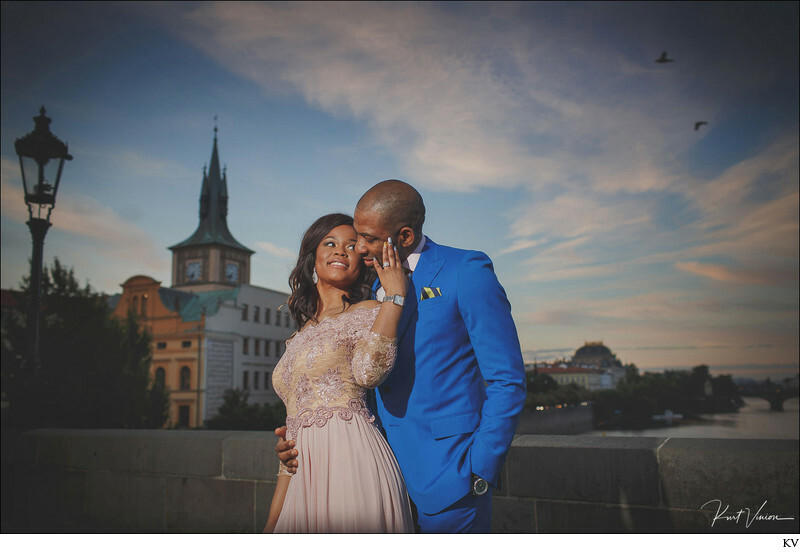 A special thanks to my crew: Eliska (hair & makeup), Kari & Zu (lighting) – the best crew in Prague! 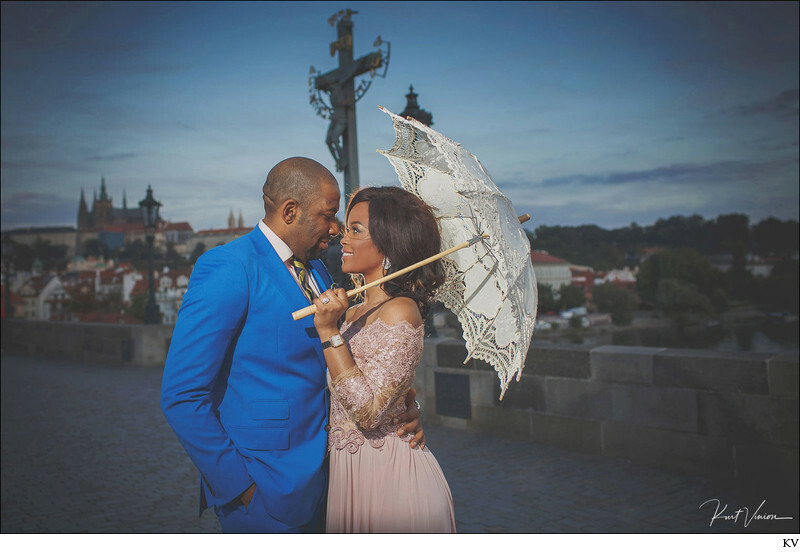 Keywords: Czech pre wedding photographer (39), Czech Weddings weddings (39), post wedding photo shoot (927), Prague (795), Prague photographer (1440), Prague portrait photographer (282), wedding photos (1317).